The next ERB, coming June 30th, has been confirmed as George Washington, general of the American Revolution, vs. William Wallace, one of the leaders during the Wars of Scottish Independence. 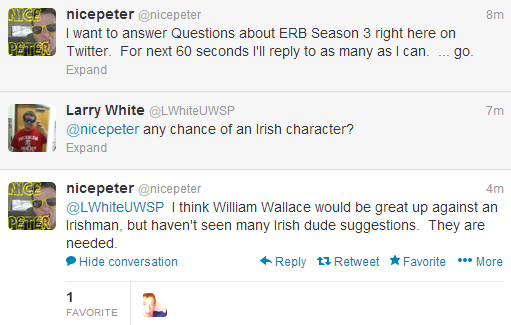 Peter has wanted to use both of these characters for a long time, but the only match-up for Wallace that had even been considered was an Irishman. Many opponents had come up for Washington that Peter responded favorably to, such as George W. Bush, Vladimir Lenin, Winston Churchill, Julius Caesar and Captain America. Peter ultimately decided it was time for George Washington in February, when he asked his Twitter followers for George Washington suggestions. George Washington was pretty much confirmed for a battle in the Monday Show. After this, some forumers began to suspect William Wallace was the opponent, while others stuck with their original predictions of Julius Caesar vs. George Washington. An article in April reported that George Washington vs. William Wallace was indeed happening, as well as Rick Grimes vs. Walter White and Goku vs. Superman, both of which turned out to be true. At this point, most forumers were convinced that George Washington vs. William Wallace. The battle was confirmed on June 16th in an ERB TV Ad. The match-up is generally viewed upon favorably by the forum, but it has received a bit of criticism by forumers who have never heard of William Wallace. For those who aren't familiar with William Wallace or his story, I recommend watching the movie "Braveheart". While it isn't the most reliable way to learn about the historical William Wallace, the film was very well received, won the Academy Award for Best Picture, and it seems to be the adaptation of Wallace that ERB is using.